1910 K Street, Washington, D.C. 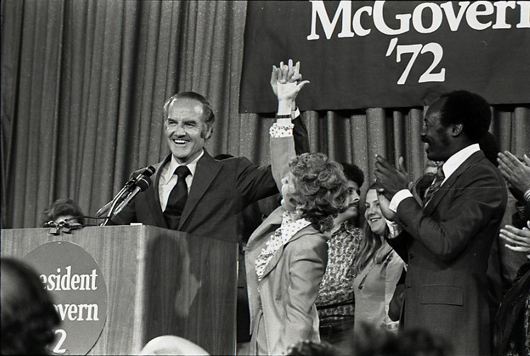 The links on this page will take you to numerous sets of photographs I have taken of Senator George McGovern, his staff, supporters and surrogate speakers. I started my work for Senator McGovern by working as a field organizer in Milwaukee during the 1972 Wisconsin Primary. From Wisconsin I went to Boston, Massachusetts. In Boston I worked with radio feeds. In those days that meant taking cassette tapes of daily statements from the candidate and forwarding them via phone lines to various radio stations. Later, I also worked in the Boston darkroom, developing film and making prints for the campaign. After the Massachusetts primary I moved to Los Angeles, California where I set up a darkroom and began taking pictures of surrogate speakers. Those photographs are the first work that appear on this page. After the California primary, I flew to Washington, D.C. with Senator McGovern and his staff. In Washington, D.C., we set up a national darkroom. We cataloged negatives of a six photographers and provided darkroom services for the campaign operation throughout the country. During the convention, we moved the darkroom to Miami and provided pictures on a daily basis. After the convention, we returned the darkroom to Washington D.C. I had many opportunities to photograph Senator McGovern, his family, staff and surrogate speaker during the campaign. 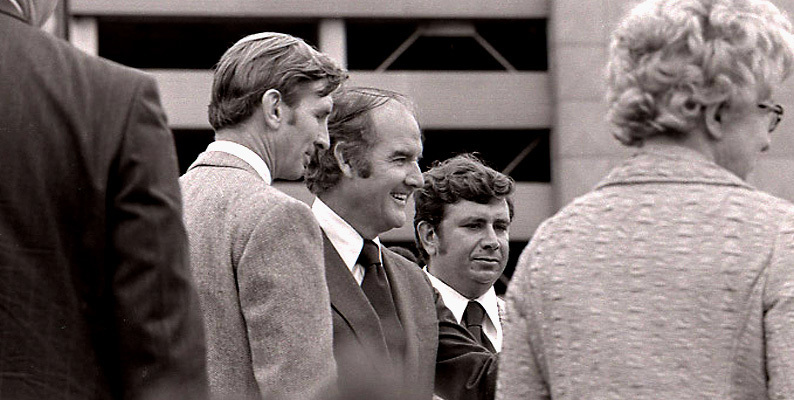 There are also links to photographs on this page that I took of Senator McGovern in the years after the Campaign. My favorites include his trip to Madison, Wisconsin to campaign with his son-in-law, James Rowen when James ran for mayor.